If you find yourself sleeping on your side you might be surprised that you are not alone. In a 2017 Danish study of over 1000 participants, side sleeping was found to be the predominant sleep position in adults. The study also revealed that we are more likely to sleep on our side as we age and with increase in Body Mass Index (BMI) (1). Shape and Size – Specifically for side sleepers the shape is very important to maintain proper alignment between the head, neck and shoulders. It’s important to keep the head at a 90 angle to the shoulders. Pillow-makers will offer many different dimensions to accommodate the unique position of side sleeping. They often times will not fit a conventional size pillow case. It’s challenging finding the best way to sleep. Back sleeping is the best position followed by side sleeping. But what do you do with your arm when you are on your side? 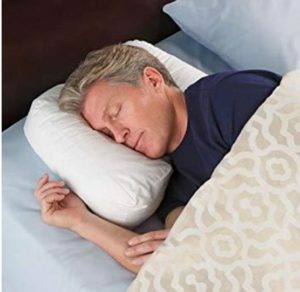 This pillow solves the problem, reducing the chances of waking up with a “dead arm” feeling or a stiff neck from being kinked while sleeping. A slight depression in the surface of the pillow prevents pressure from building up on the ear and provides optimal neck support. This is a good option for a side sleeper especially if you have broad shoulders. 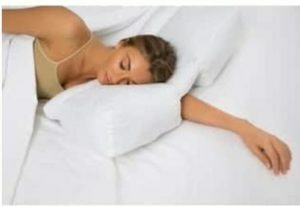 Even though it is not designed for placing your arm underneath your head because of the thickness of the pillow you may not find that necessary. Good price with a more familiar size to your conventional pillow. The most unique design I’ve seen so far. Good for those who are back and side sleepers. Lots of support with the “side wings” to support you head when you turn on your side. 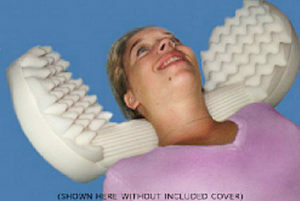 Ideal neck support is actually head support. By placing the head on a pillow you are reducing the kinking between your head and shoulders. It will also relieve pressure on your arm which promotes proper circulation. Women in particular may find greater comfort with support between their knees. Women generally have wider hips than men which can create larger space from knee to knee when on their sides. According to work done by Merry, 2005, the angle between the inferior pubic bone arch is about 70 degrees in men, but 90-100 degrees in women. The bones forming the arch are more concave in women but straight in men (2). Particular, women find it beneficial to use a pillow between their knees to reduce the angle of their legs. It is best to use a pillow that is firm and thick but breathable to reduce over-heating. (2) Merry, Clare V. (2005). “Pelvic Shape”. Mind- Primary Cause of Human Evolution. Trafford Publishing. ISBN 1-4120-5457-5. Retrieved 2010-08-14.